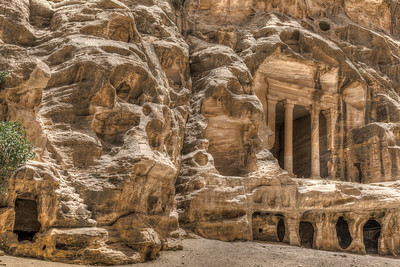 Architectural marvels of the lesser known Little Petra site in Ma'an Jordan. 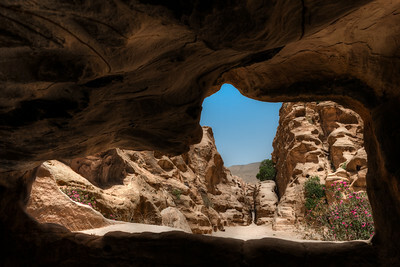 Located just a few kilometers from the world-famous UNESCO site of Petra, Siq Al-Barid is a much more quiet and can easily be viewed without large crowds. 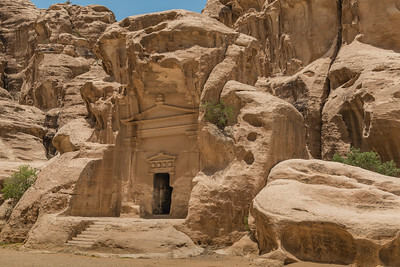 Facade of a mausoleum in Little Petra, Ma'an, Jordan. 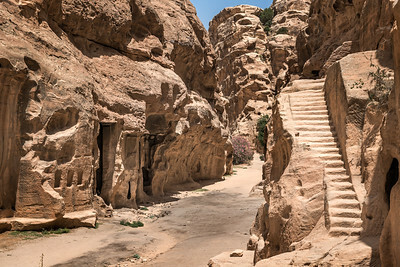 Steps and doorway sculpted in a Greco-Roman style in a cliff in the ancient Nabataean city of Siq Al Barid (Little Petra) situated in the Ma'an governorate of Jordan, near the city of Wadi Musa. 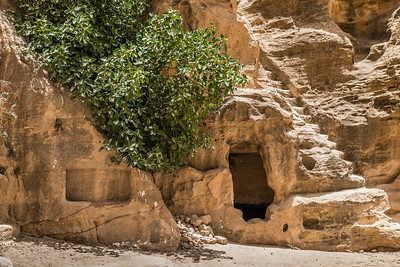 This mausoleum is set above a short flight of stairs near the entrance of the siq (canyon). 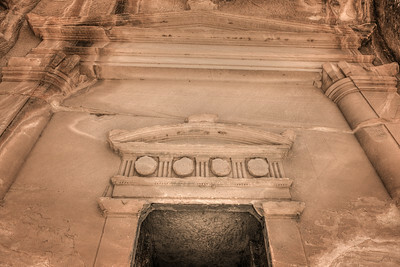 Above the entrance is an arched pediment with raised disks in the metopes. The monument also has a triangular pediment with urn finial resting on two engaged horned columns. The facade is dated to in between the first century BCE to the first century CE. 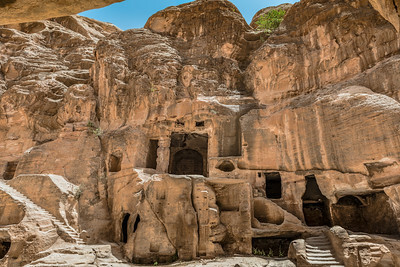 Archway and carved facade in the cliffside at Little Petra (Al Beida) in Ma'an Jordan. 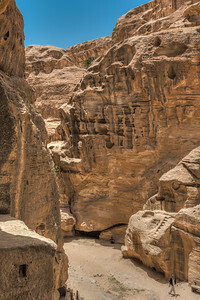 View of Siq al-Barid canyon as you enter the site. 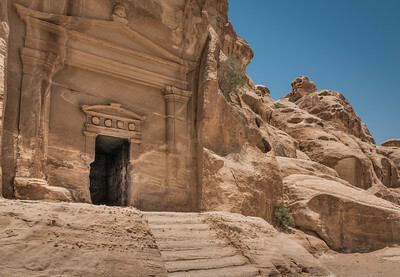 Little Petra, Ma'an, Jordan. 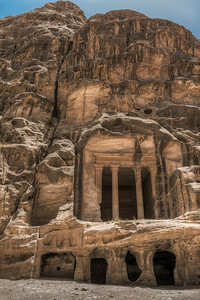 Columned chamber sculpted in a Greco-Roman style in a cliff in the ancient Nabataean city of Siq Al Barid (Little Petra) situated in the Ma'an governorate of Jordan, near the city of Wadi Musa. The chamber, which isn't any decorated or carved inside, is fronted by two standing columns in antis (a row of columns that is set in a line across an entrance, between two pilasters or corner posts). 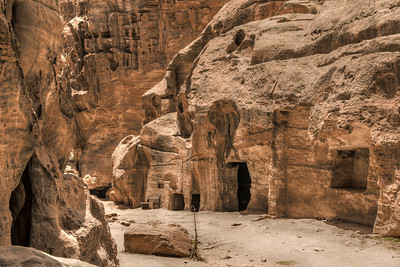 Below the main chamber is a cave house, with three rooms. One room has recessed shelves in the walls. The columned chamber may have been a memorial cult site, with the house below serving as a residence for whomever was responsible for the rites. 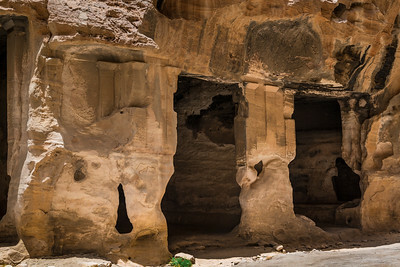 View from inside the cave-house below the sculpted columned chamber in Siq al-Barid (Little Petra), Ma'an, Jordan. 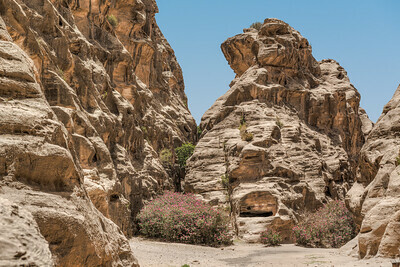 View of the Siq of Little Petra, including a cave-house and bench in Siq al-Barid (Little Petra), Ma'an, Jordan. This biclinium (a Roman dining room with two benches), dated back to the first century CE, contains the only surviving example of Nabataean painting. 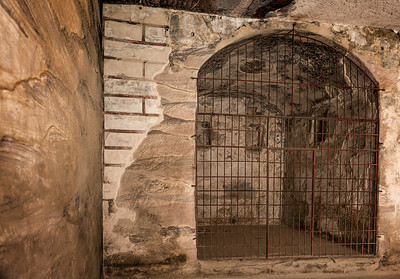 The interior wall is protected by an iron gate. 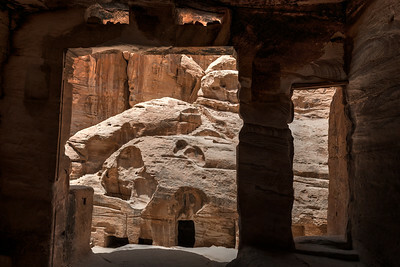 Several baetyl (a sacred standing stone ("god block") that represents a divinity) niches surround the outside of the chamber. 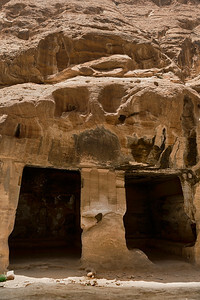 Painted Biclinium in Little Petra, Ma'an, Jordan. This biclinium (a Roman dining room with two benches), dated back to the first century CE, contains the only surviving example of Nabataean painting. 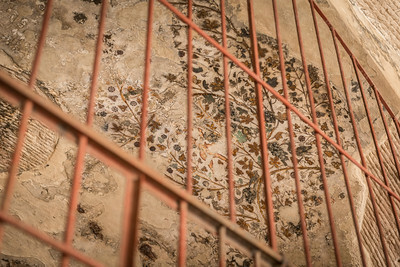 The ceiling is decorated with flowering vines done in a Hellenistic Alexandrian style. 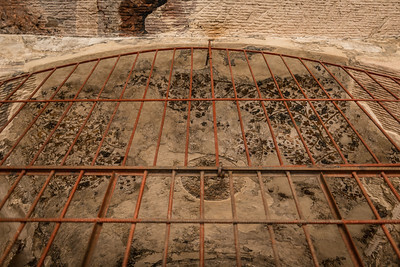 The interior wall is protected by an iron gate. Several baetyl (a sacred standing stone ("god block") that represents a divinity) niches surround the outside of the chamber. 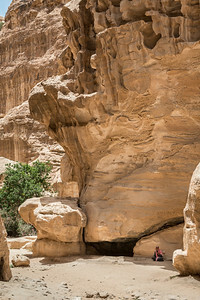 Man sitting in the shade in Little Petra, Ma'an, Jordan. 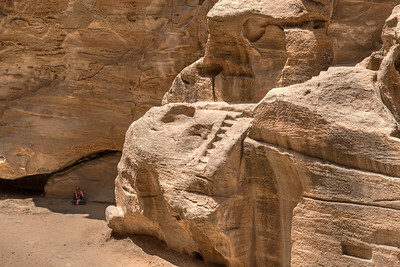 View of the site of Siq al-Barid, as seen from the painted biclimium, near Wadi Musa, Ma'an, Jordan. 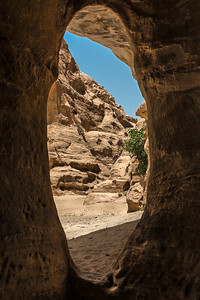 View of the Siq (canyon) in Siq al-Barid, Ma'an, Jordan. 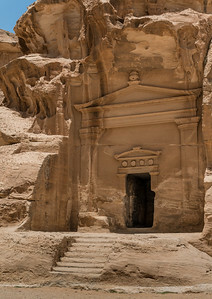 Doorways and stairs leading to different monuments and tombs can be seen on either side of the canyon. 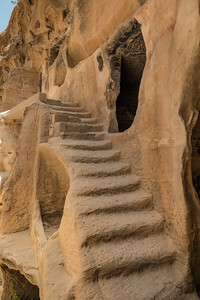 Ancient staircase leading to a tomb on the site of Siq al-Barid (Little Petra), Ma'an, Jordan. 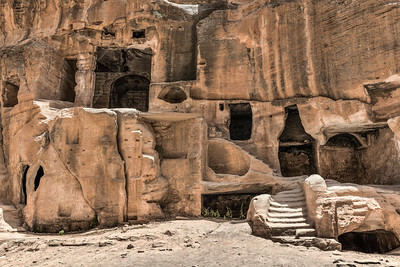 Ancient monuments (tombs, mausoleums, cave houses) in Siq al-Baid, Ma'an, Jordan. 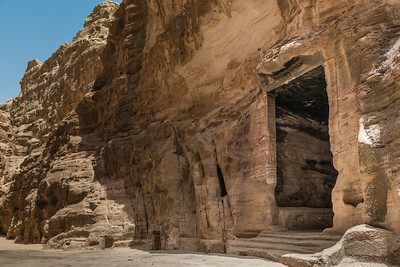 Ancient sculpted doorway (possibly to a tomb, mausoleum, or cave house) in Siq al-Baid, Ma'an, Jordan. 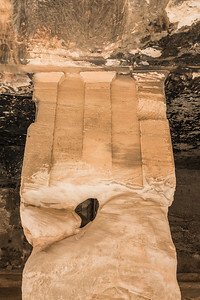 Close up detail of a heavily eroded sculpted column in Siq al-Barid (Little Petra), Ma'an, Jordan. 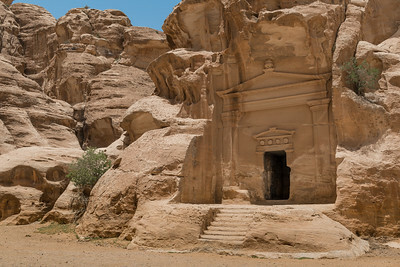 Facade of a mausoleum in Little Petra, Ma'an, Jordan. 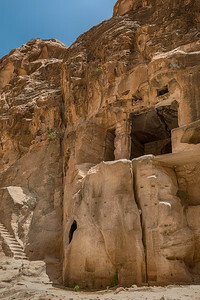 Steps and doorway sculpted in a Greco-Roman style in a cliff in the ancient Nabataean city of Siq Al Barid (Little Petra) situated in the Ma'an governorate of Jordan, near the city of Wadi Musa. 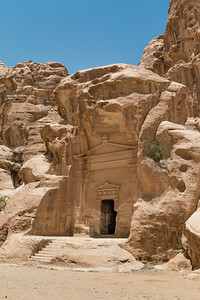 This mausoleum is set above a short flight of stairs near the entrance of the siq (canyon). Above the entrance is an arched pediment with raised disks in the metopes. The monument also has a triangular pediment with urn finial resting on two engaged horned columns. The facade is dated to in between the first century BCE to the first century CE.